We know longer promote Bet365 Bingo. For a list of our accredited UK bingo sites visit here. 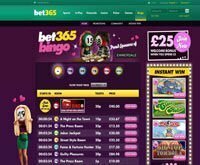 Bet365 Bingo is powered by the software provider “Playtech” and is owned by Bet365 Group LTD. You are able to use many different methods of payment including credit card, online transfers and more. You are able to play in your own currency and the languages supported are English, Swedish and Spanish. Bingo Linx: Everyday at 12:00, 18:00 and 22:30 in the Guilty Pleasures, Kiss & Tell and The Cat Walk Room. Over £300,000 in prizes to be won every Month. Feel Good Friday: £50,000 needs to be won every Friday at 18:00 in the Guilty Pleasures Room with games like 1&2TG, Last Chance Saloon, Friday Night Fever and more. With guaranteed games of £400 up to £5000 and just 10p to 50p a ticket. £20,000 Winning Wednesday: Every Wednesday 1&2TG prizes, Starting at 19:00 in the Guilty Pleasure Room. Prizes Varies from £200 to £400. Super Free Bingo With a Twist: 1 hour every day in the Super Star Bonanza Room at 13:00 and another 2 hours at 19:00 to 21:00 UK Time. Either play for free and win small amounts or play for pennies to win larger jackpots of £1,050 to £1,500. Any money won with free tickets gets converted to bonus bucks and must be wagered 4x. Depositing players only. Currencies: ARS, AUD, BGN, BRL, CAD, CHF, CZK, DKK, EUR, GBP, HKD, HUF, INR, ISK, JPY, MXN, MYR, NOK, NZD, PLN, RMB, RON, SEK, SGD, THB, TWD, USD and ZAR. Deposit Methods: VISA, MasterCard, Moneybookers, Instadebit, Click2Pay, Bank Wire, Cheque, MoneyTT, Maestro, Visa Debit, Neteller and Paypal. Minimum Withdrawals: Depends on the Method, £5 debit card, £10 to credit card, £25 Bank Transfer, £50 Virtual Prepaid card and £100 Cheque. Maximum Withdrawals: £20,000 for Credit and Debit Card, £25,000 Skrill, £37,500 Neteller, £2000 Paysafecard, £99,999 Entropay, £100,000 Bank Transfer, £50,000 check. Withdrawal Times: Up to 48 hours to process and then immediate up to 2-5 business days. May take longer for Checks. Facebook: https://www.facebook.com/Bet365-Bingo-Offers-718743544950081/ Check out their fan page for all the latest bonuses and promotions. Loyalty Scheme: Loyalty points are earned playing bingo, slots and scratchcards. Six Points every £10 staked on Bingo, two points every £10 staked on Scratchcards and one point every £10 staked on slots. Casino Games: Keno, Roulette, Blackjack, Slots, Card Games, Table games, Sportsbook, Skill Games Numbers &amp, High-Low and Video Poker. Featured Slots: Deal or no Deal, The X Factor Jackpot, Iron Man, Action Bank, Fireman, Centurion and Nest Egg etc. Live Dealer: Yes, Blackjack and Roulette. Chat Games: Fun Fortunes, Karaoke Queen, CM Double or Nothing, I Spy, Anagrams, Twist and Shout, Birthday Bingo and Dare to Dodge. The languages supported include: English, Norsk, Deutsch, Español, Svenska, Português, Dansk, Română and Polski. Accepted Players: United Kingdom, Canada, India, New Zealand, Mexico, Brazil, Finland, Frence, Germany, Ireland, Netherlands, Norway, Poland, Portugal, Russia, South Africa, Sweden, Switzerland, Uk. Accepts Australia or USA Players: No, but Sportsbet is available for Australian players. One of the more fascinating accepts of Bet365 Bingo is how versatile it is. Although American and Australian players are not allowed, almost all other nationalities are able to play. 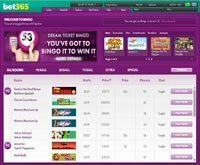 Bet365 Bingo like all bingo sites has free bonuses. If you spend $£10 you will get $£20 free. Ongoing bonuses can be as high as 50%. The minimum amount that is needed for a deposit at Bet365 Bingo varies and this depends on the form of payment you select. While the Bingo section of this website was only made available in 2008, Casino & Sportsbetting have been available since 2001. The most recent addition is live casino games. The software for the website is adequate, while still being very functional and easy to use. The player experience has been described by some as being amazing. 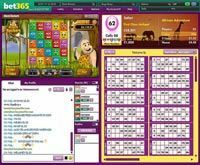 Bet365 Bingo is set up in the perfect manner for an individual who is looking to play for long periods of time. You are also able to have the website displayed in multiple languages.